To let a person know you miss them requires the perfect words as well as the right action to make the gesture heartfelt and moving. It is your deepest emotions that come to the surface when you reach that special person in your life with earnest gestures. How to tell someone you miss them may be one of the hardest things you have to do in your life, and you can convey this message in a number of ways. 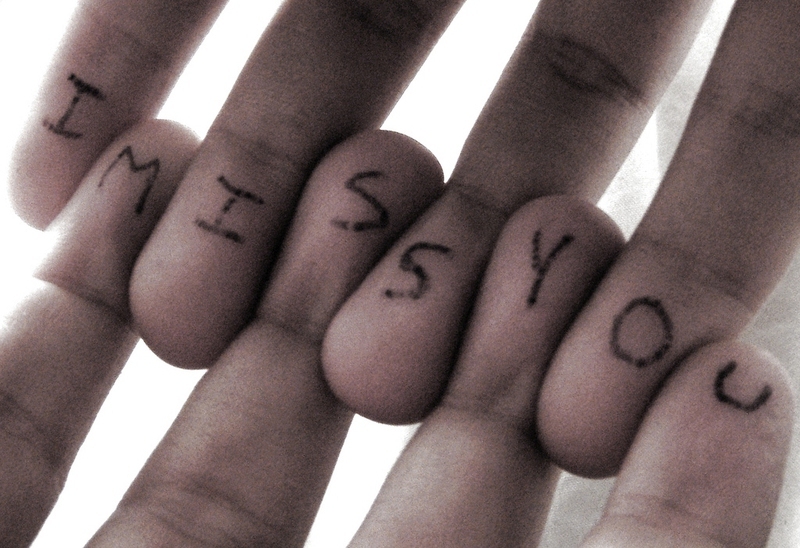 It is hard to know how to tell someone you miss them when they are not around. If the person has moved away from where you are or lives far away, surprise them with a visit and tell them in person how much they are missed. Tell them in person how much their absence is making you sad, and how much you miss having them around. Pick up the phone and call them - another great way of how to tell someone you miss them. Let them know how important they are to you, and how much you miss them because they are not with you. Even though you are not in front of them in person, sincerity and emotions can always be felt through the phone. Write them a letter, in the old fashioned way, and send it via mail. In this age of emails and text messages, everyone is still delighted to get letters, especially one that contains heartfelt messages. Write them a poem about love, longing and how much they are missed. You don't have to be Shakespeare and write something extraordinary, just a few rhyming sentences to let them know of your feelings. Another meaningful way of knowing how to tell someone you miss them would be through songs. Sing them a song on the phone, or leave a song on their answering machine. Make them gifts that are meaningful and will make them feel appreciated and loved. A basket filled with everything that they love would be a great way to let them know how you feel about them not being with you. Here are 30 quotes to help you in conveying your message to the person you are missing. A-B-C-D-E-F-G-H-I-J-K-L-M-N-O-P-Q-R-S-T-V-W-X-Y-Z. Did I miss something? Yes, I missed "U"! I did three things today: miss you, miss you, and miss you. I think we dream so we don't have to be apart so long. There are some moments in life when you miss someone so much that you just want to pick them from your dreams and hug them for real. Missing you is like breathing…it just comes naturally to me. And if you are listening, I miss you. And if you hear me now, I need you. ... And I am just waiting for you to say that you miss me; because I miss you every day - every hour, every minute, every second! I miss you once, I miss you still; I always had, I always will. Eight letters, three words, one regret: I miss you. I can no longer see you with my eyes, touch you with my hands; but I feel you in my heart forever. Missing you comes in waves; tonight, I am drowning. I miss our conversations; I miss how we used to talk every minute of every day, and how I was able to tell you everything that was on my mind. I look up to the sky and talk to you. What I wouldn't give to hear you talk back. I miss your voice, your laughter; I miss everything about you! I miss you like the sun misses the flowers, like the sun misses the flowers in the depths of winter. Before I sleep and after I wake up and all the hours in between … you occupy my mind. You come to my mind morningly, nightly and noonly; I wish I could see you this minute, or soonly! I wish you were here, but you’re not here, you’re there. And there doesn’t know how lucky it is.